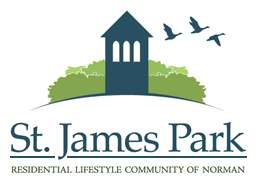 St. James Park is an all-encompassing lifestyle that you will be proud to be a part of. It is seemingly tucked away while conveniently located near the bustling shopping, dining and commercial sectors of Norman. With acres of rolling fields, tranquil ponds and walking paths, St. James Park pairs a comfortable environment with exquisite custom homes and optimal amenities. It’s more than a neighborhood, it’s a lifestyle. St. James Park has an outdoor experience for you. Sitting on more than 200 acres, our community boasts miles of walking paths, 3 large tranquil ponds, and a full basketball court. Our welcoming clubhouse is a gathering place for neighborhood meetings and can be utilized by members of our community for private events such as family reunions and birthday parties. The clubhouse features a modern kitchen, dining room, and fireplace, as well as an Exercise Center equipped with Life Fitness equipment. Lounge with your favorite book, take a refreshing dip, or swim laps. Our swimming pool is conveniently located at the center of the neighborhood, where community members are invited to relax poolside in one of the many deck chairs or splash around in the 50-foot pool. St. James Park is located in the highly praised Norman Public School District. This neighborhood is served by: Reagan Elementary School, Washington Irving Middle School, Norman High School.